NuPhysics has developed a pioneering algorithm for multi-phase computational fluid dynamics (CFD) that is capable of solving problems that were previously unsolvable with CFD. Our innovative software is based on derived quantum-thermodynamic properties, the result of 40 years of scientific research and innovative software development. The advantage of this formulation is that you do not need any particular empirical properties of the system – all calculations are based on quantum values. 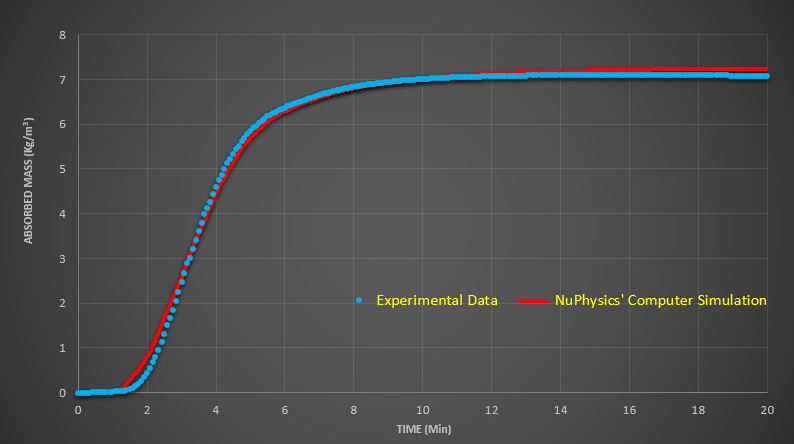 This means that fewer experimentally-derived parameters are required, allowing you to design your solutions at a lower cost by avoiding expensive experiments. This is especially important for multiphase flows where the rate of mass and energy transfer plays a critical role in flow simulations. Our algorithm is able to accurately predict challenging physical phenomena such as evaporation and adsorption. With a single set of experimental data, our Virtual Adsorption Apparatus, for instance, predicts the rate of adsorption for different flow rates and pressures. This allows our customers to reduce lab experiments from 5 weeks to less than a week.